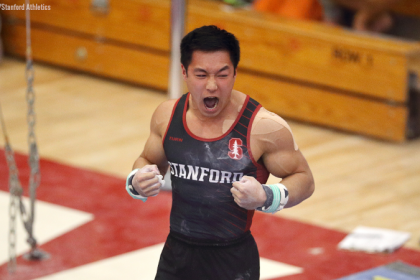 It was a quiet opening weekend in DIII gymnastics with only four teams competing, but a good weekend nonetheless. We got to witness the return of some of the top gymnasts in the division like Brockport’s Candis Kowalik and Cortland’s Emma Schulz along with some new stars like UW-Oshkosh’s Emily Gilot and Cortland’s Megan Hanley as they took the stage for the first time. In the last lineup set of the night, Slater hit her upgraded first pass—a front layout to front double full—to solidify the win for Hamline. 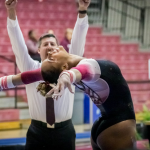 She also capped off the night with the highest score of the entire meet, receiving a 9.675 for her set. Gilot was set to be a vault star for the Titans with her Yurchenko layout half, but it quickly became apparent that her other events were not to be discounted. Her big Gienger and floaty Pak made her a standout on bars, a unique wolf jump to punch front connection set her apart on beam and a fun rudi + split jump + punch front combo pass added to her already difficult floor set. Expect big things from this freshman who won both vault and the all around in her collegiate debut. The Big Storyline: One of the craziest parts of this meet was that Cortland was able to top Brockport on floor. The Golden Eagles typically shine on this event; however, tonight they played with the lineup a bit and rested some of their usual top scorers. This, coupled with strong performances from Schulz and Rachel Filipski allowed the Red Dragons to pull ahead and end their night on a high note. Implications: Though it’s not a huge surprise that Brockport came out on top, Cortland trailing by three and a half points is a bit shocking—especially considering the uncharacteristically weak floor rotation from the Golden Eagles. Records: This was Brockport’s eighth-straight first meet win. The Big Storyline: Even without full difficulty and full lineups on the first two events, UW-Oshkosh was able to hold its own against 2018 national qualifier Hamline. Though some possible confidence and endurance issues held the Titans back on the last two events, there were glimpses of greatness, and this team is one to watch, especially as the freshmen—who contributed half of the lineup routines and anchored every event—start to settle into their roles. Hamline struggled on the first two events, having to count a total of four falls. But the team bounced back on the last two and were able to cap the night off with strong floor sets from Caitlin Cooper and Darby Slater that we came to love last season. Implications: Hamline came in as the favorite to win this meet and although the team did come out on top, the fact that UW-Oshkosh came within two points even without full difficulty and major struggles on beam and floor should keep the Pipers on their toes. 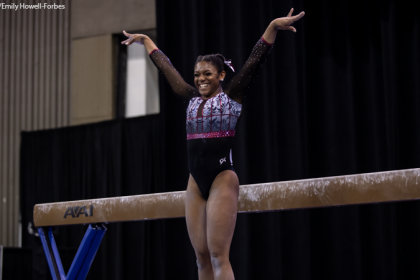 Controversies: There were judging conferences after nearly every beam routine for both teams. This caused major delays and made for quite a really long time between their touch and actual competition routines.